Can You Talk Politics in the Office? | Challenger, Gray & Christmas, Inc.
“While the 2016 election is still more than a year-and-a-half away, hopefuls are announcing their candidacy and the political rhetoric is already getting heated. The campaign fervor can easily spill over into the workplace, as supporters share their political perspectives verbally and through social media,” said John A. Challenger, chief executive officer of global outplacement and executive coaching firm Challenger, Gray & Christmas, Inc. In a CareerBuilder poll conducted during the 2012 mid-terms found that 42 percent of respondents said they avoid talking politics at the office, while 44 percent said they talk about it, but shut down the conversation when it gets heated. 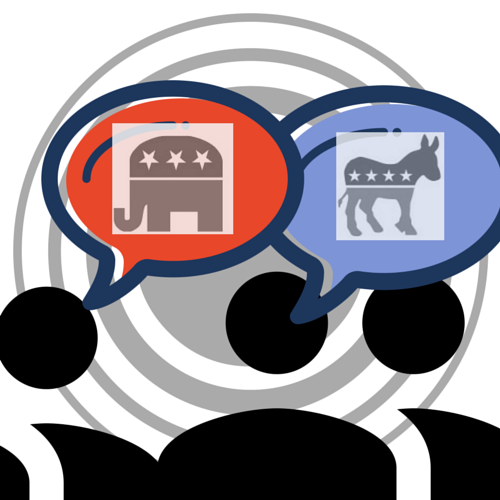 Only 14 percent said they engage in lively political debates at work. “Debating the issues at work can have its benefits, but there are a lot of pitfalls to avoid. Just as with other touchy subjects, such as religion, one must be careful about when and with whom to share political views,” said Challenger. “One of the keys to political discussions at work is to keep them brief and light. The last thing you want is for conversation to become confrontational. Additionally, your future at the company depends on how much supervisors like you. Do not allow your political views be a determining factor. “Supervisors should also be particularly careful about engaging subordinates in political debate. In today’s political arena, where political and religious views are often closely entwined, supervisors should avoid putting themselves in a position that could leave them vulnerable to discrimination lawsuits,” said Challenger. Challenger, Gray & Christmas issued the following suggestions for keeping political discussions from negatively affecting one’s career. Keep it civil: Do not let friendly banter deteriorate into the name-calling shouting match. Know your colleague: Career-wise it is probably safer to converse with those who share your views. If unsure about a colleague’s views, then avoid political conversations or carefully probe for his or her views. Do not campaign: Give and take conversations are acceptable, but campaigning can be off putting. If someone expresses discomfort with political discussions, respect his or her wishes. Stick to politics: While politics are increasingly entwined with religion, consider that aspect of the debate off limits. Do not evaluate based on politics: You may not agree with a co-worker’s political views, but, if you are a supervisor, do not let that influence your assessment of that person’s work and/or value to the company.